Hawaii, the 50th US state, is a chain of volcanic islands transformed by eons of heavy rainfall into a lush, tropical "paradise". The chain's "Big Island", Hawaii Island, is home to Hawaii Volcanoes National Park, which includes the active Kilauea Volcano and 14,000 foot Mauna Loa. Mauna Kea, on the island's north side, is considered by some to be the highest peak in the world, taking into account an elevation of 33,500 feet from its base in the Hawaiian Trench beneath the sea. The island of Maui Island is actually made up of two volcanoes and is referred to as the "Valley Island" due to its many resultant canyons. Kapalua Bay, on the west side of the island, is famous for its snorkeling opportunities. Other popular tourist destinations include 10,000-foot Haleakala, Haleakala National Park, and the scenic drive on the Hana highway. The small island of Lanai, just west of Maui, is a landscape of lush and succulent plant life encircled by white sandy beaches. The Garden of the Gods on the island's north side resembles a sculptured rock garden. It's easy to understand why the Hawaiins might have conjured the image of some divine being placing each lava boulder across the crimson landscape. Molokai Island is often called the "most Hawaiian" or "friendly" of the islands. Once largely a leper colony, it is now known for its breathtaking beauty, dense rain forests and deserted beaches. The absence of shopping malls, stop lights or buildings taller than a palm tree can create a welcome retreat for those seeking pure relaxation. Oahu Island continues the gradual northwest swing of the Hawaiin island chain. Home of the state capital, Honolulu, Oahu is the most commercially developed of the islands. Many sun and fun seekers come here to revel on Waikiki Beaches, a 1 1/2-mile stretch of sand guarded at one end by Diamond Head. 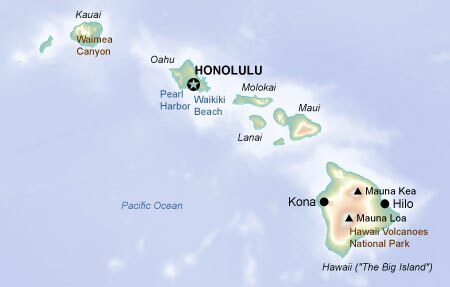 Pearl Harbor and the sobering USS Arizona Memorial are also located on Oahu. Last in the string is Kauai Island. This rugged, mountainous island is where Captain James Cook, with his ships Discovery and Resolution, became the first European to set foot on Hawaiian soil. Waimea Canyon on the west side was dubbed the "Grand Canyon of the Pacific" by famous author Mark Twain. The north shore features the Na Pali Coast, which rises to 4,000 feet above the Pacific Ocean; Kauai's north shore is home to the National Tropical Botanical Gardens. Other destinations on the island include the Coconut Coast on the eastern side, Lihue, the county seat and main business district of the island, and Kalapaki Beach. There are many ocean-front condos on Kauai, an example being Puu Poa which is located on a bluff in Princeville.